Scenes from our February 3rd rehearsal weekend. As the 2017 season rapidly approaches, United took the time yesterday to share a few moments with Family, Friends and Alumni. United Percussion will be hosting a performance for all Family, Friends, and Alumni on Sunday, January 29th followed by a history night for all to enjoy. After an impressive turn out for the 2nd time last year, United is happy and excited to reconnect with our fans and alumni and provide a preview of the 2017 program. On Tuesday, November 29th, we are joining numerous other organizations by taking part in the international celebration #GivingTuesday, a chance to give thanks by giving back. Learn how you can support United in this endeavor. After two very successful audition days in September and October, United Percussion is proud to present it's 2017 cast. The 2017 season has officially started with the first of two audition dates completed yesterday at Sterling High School in Somerdale. The rain held off and United enjoyed another year with it's highest numbers at a first audition to date. Check out installment #4 in our 2017 audition tip series. In this video, UQ veteran Kirby Marino talks about being a part of United and how it's become his second family. In this video, Front Ensemble Caption Head and veteran Dave Osworth talks about his experience with United and what he's looking for in potential members. United is now currently accepting registration and download of our 2017 Visual Ensemble Guide. After having it's largest visual cast to date in 2016, United is looking to expand upon it's performer base and grow even larger in 2017. In this video, veteran Jeancarlo Rodriguez talks about why he's chosen United and why auditioning has changed his life. In this video, staff member and veteran Stephenie Sofield talks about her #UP experience and offers up some thoughts for those looking to audition. As United's 15th season draws closer, the Front Ensemble staff has and will continue to offer some of the best educators and education in the world of marching percussion. Behind the scenes on Tuesday, July 19th, United was contacted to have the opportunity to perform with Andra at the Democratic National Convention. Quickly mobilizing and planning logistics was a priority quickly put into place by Chad Moore, Director. United Percussion is thrilled and honored to announce that we have been selected to play at the Democratic National Convention on Tuesday night with Grammy nominated national recording artist Andra Day in Philadelphia at the Wells Fargo Center. Additional preparations are underway to continue to make United Percussion's 15th season it's best to come. We couldn't be more enthused to announce more key additions to our 2017 staff. As we solidify our plans for 2017, and prepare for our auditions in September, we'd like to announce our additions to the Front Ensemble staff. The #UPFront staff looks forward to continuing a tradition of excellence. 2017 marks United Percussion's 15th year as an indoor percussion organization dedicated to the development of young performers of all ages through the visual and performing arts. Audrey first came to United Percussion in 2009 when she was only fifteen. Fast forward seven seasons and she's aging out as our center marimba. Audrey has been a part of United for longer than most staff, instruments, or rehearsal facilities and has grown in countless ways over the years. She has mastered “Rule #9: Figure It Out” in every sense of the phrase and wouldn’t ever let an obstacle stand in the way of her or rehearsal. Audrey puts every ounce of energy into each note and motivates the entire ensemble through her passion and dedication. In addition to United, Audrey has marched at Rancocas Valley High School, Raiders Drum Corps, and taught various high schools in the tai-state area. Outside of United Audrey can be found cleaning houses, training animals, being a personal stylist, or writing music. I chose UP originally because it was close and I had no idea what on earth was going on. But I continue to stay at United because I have never had a more stable home, a more accepting family base, or more fun than what I have here. UP is the largest family anyone could ask for, we are so quick to accept people from all different places and backgrounds, we will throw you into the mix, you will be family whether you like it or not. Without United I would have had no sense of home or stability in my life. I personally have gone through quite a few trials in my life, some trials took place at United, but in the end United always helped me work through my problems. It didn't completely fix my problems, no. It did me one better. It gave me the tools necessary to solve problems on my own, with confidence, strength and as always, a GIANT family backing me up no matter the outcome. How could I choose any other place, when I know exactly where "home" is? You can jump higher than the hurdles that pop up in front of you, and if you can't we will show you how. Because that's what United is. We won't stop you from falling, but we will teach you how to fly. 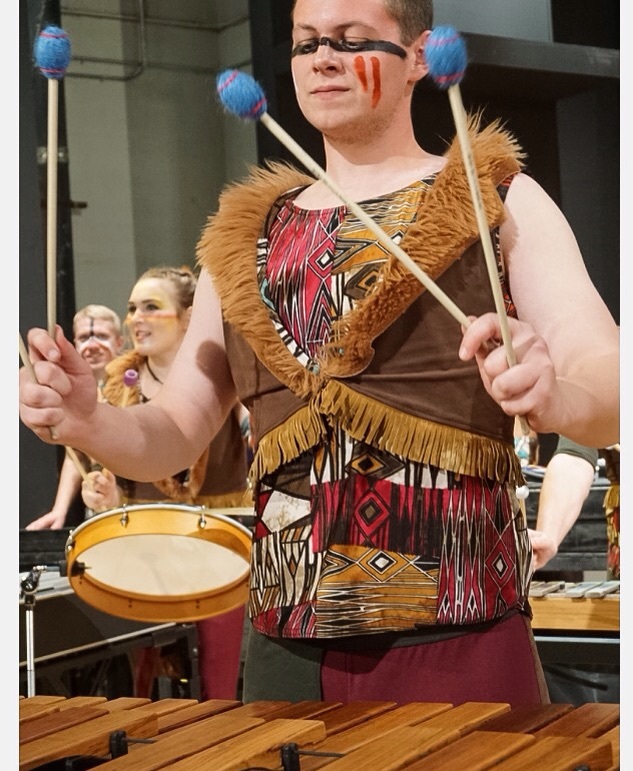 This is Nick’s second year with United Percussion as a part of our marimba line. His marching career began back in 2011 with North Penn High School’s indoor percussion ensemble. Since then, Nick has also marched with the Reading Buccaneers, Field of View Indoor Percussion Ensemble, and taught various groups in the area. He looks forward to teaching at Fusion Drum and Bugle Corps this summer. In addition to his involvement with the marching arts, Nick studies Music History and Clarinet at West Chester University, plays recorder in a medieval and renaissance ensemble at WCU, and works at Wawa. Nick brings an incredibly high level of musicianship to United Percussion with a side of sass and a constant drive to improve. I chose to march with United Percussion because it was one of few world class groups in the mid-Atlantic area, but more than that because many of my friends, colleagues, and role models had been involved in the organization. United is a place where I could hone my craft of mallet playing and pageantry performance with people that have become my closest friends. United has given me the world-class instruction and tools I needed to fuel my love for the art form that is marching percussion, and to share it with the young minds I teach. It's for these reasons that I returned this year and plan on marching my age-out season next year here. This is Akiel’s third and final season as a member of United's snare line. He first joined marching band in 2009 and was actually cut from trumpet on his first day. He ended up playing timpani that first season and grew more interested in drums as the season progressed. Akiel joined his high school’s drumline the next year and he’s loved it ever since. He stopped playing after high school, but was inspired to start marching again when he saw his good friend "Paco" (Alejandro Gallo) marching drum corps. Since then, Akiel has marched snare at the Raiders Drum and Bugle Corps and DCA's White Sabers. Outside of United Percussion, Akiel is a biotechnology major at William Paterson University, a barista at Starbucks, and works at City Hall in his town. Ironically, the only item he drinks from Starbucks is their lemonade. He doesn’t believe that chocolate is a candy, but his favorite chocolate bar is a Snickers and his favorite actual candy is Skittles. In his free time, Akiel can be found watching anime or making homemade fries. I love all of the people I've met here. It's become a second family. Aside from improving as a percussionist, I've learned so much about being a better person through all of the scenarios we are faced with while doing this activity. The family aspect will always be my favorite part about this organization. With an organization like this one, no matter what your situation is, you will always have someone there for you.